I live in vancouver BC canada. This plant is growing somewhat wild on my block. It is beautiful, sweetly fragrant, vining? Can you identify it for me? Who wouldn't like a plant that has a name like that? 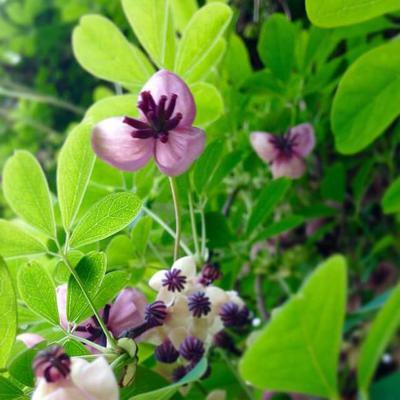 It's true botanical name is Akebia quinata, reflecting the five fingers of the leaves. It's also called Raisin Vine, but some sources are doubtful about recommending this plant as edible. Please do be careful if you're thinking of planting this one; it tends to be extremely aggressive in growing to the top of trees and smothering them. Good luck with it. See more about it (and please do read the reviews about it below the description); Akebia on Daves Garden Website.